it looks like it has become a habit to take outfit pictures in our favorite park during the weekend. i must say the park looks entirely different now than it looked 2 weeks ago, when it was all covered in snow. had it been warmer outside you would have though spring was on it's way. far be it from me to play the forest fairy, even though the scenery surely offered the perfect setting. i wanted to play a bit with fabrics and pairing together things that you wouldn't normally think of as complementary. i started with a lace top and worked my way around it. 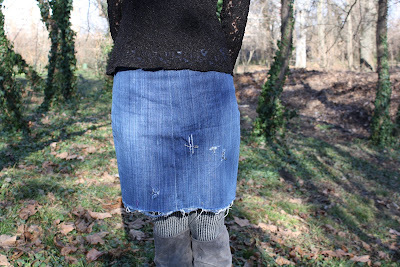 i knew i wanted to pair this delicate fabric with something more rough and so i went for a customized denim skirt. i've had this thing since college, it was a hand-me-down from one of my roommates and it's very dear to me. it looks so punk with all the safety pins and paper clips that are holding it together. now that i think about it i could have gone for some distressed tights, instead of the black and white houndstooth printed ones. on the other hand, i do like the way they look grey from a distance and blend in with the boots. anyway, i'm really happy with how it all came together, it was the perfect weekend look. not sure if i can pull this off at work, but i might just try it one of these days. That park does look like a beautiful setting. I'm loving the lace shirt and boots. I am having a Magazine Giveaway, be sure to stop by and check it out at www.missbias.blogspot.com. Pretty style, nice pics and amazing combo with this shirt, jeans skirt and awesome boots !